Hymns, and folk tunes, the perfect winter day. I have gathered thoughts around my banjo, and found myself pulling strings of hand written songs, and heart spun melodies. It's nice to escape the world of television screens, and internet highways. To be away from the telephone, and closer to the kettle, is how I ought to be lately. To appreciate, and fully hold hands with your surroundings, you have to escape every once and a while. Playing an instrument is one of the nicest ways to reconnect myself to things I've forgotten, or taken for granted. Like the mountains, the sky, the kettle coo, or the oven. When I hear the echo of the moon shaped instrument, I feel as though I am reminded. Reminded of the sweet things that exist without sockets, or buttons. If you've ever traveled to the land of instruments, or music making, you'll understand what I mean. If you've never, then I suggest you press those piano keys, pull those guitar strings, hammer on that banjo, bang on that drum, sing to the tune of that sparrow's song. When your hands meet an instrument to compose an echo, a patter, a slap, a shriek, or a sigh - it's as if the mossy hill and the skyline meet. As if we're all heaven bound when our instruments are singing. I've often wondered what I've spent my life doing before I found melodies, and song strumming. When I imagine those days, I imagine a girl without wings - or teeth. I did not take flight - the way I do now. I did not chew my food - the way I do now. I blame the years of empty fingers on my poetry. I suppose, I left the grandmother gifted guitar in the stand, because I figured my poetry was enough. And truly, my poetry is enough, sometimes. Penning words will always be my favorite pastime. But music, music is something else. Written poetry is the evocation of my own feelings and sounds. Where as, Music creates a fabric - a gently sewn masterpiece of not only sounds, but of poems, and paintings, and story telling..... A collaboration of all things beautiful. Poetry is to music what Tea is to the kettle. The prepared leaves of a flower are carefully placed to sweeten your cup, but what is the tea cup without the kettle's coo. We sweeten our bellies with poems, but for us, the songstresses, and the tea drinkers, we are not complete until we hear our instrument's humming, or our kettle's meowing. Our books, our teacups, and our poems remain unfinished until we make our throats, our hands, and our tea pots sing. Remind yourself: We are lucky to know the stretch in our fingers when composing a tune. It's as if we're song birds sitting on a pine, becoming one with the world around us. You know, if you look around you, you'll see that music is everywhere. In the bark of the wolf, in the wild horse neighing, in the swirl of the river, in the 4 am sleepless television screen, in the mother's lullaby, in the folk song, in the hip hop ballad, in the chanting of a stadium, in the birds cry, in the howl of the wind. Everywhere. When we begin to listen to our surroundings, we can better understand why people strum, sing, compose, or sway. Sound is beautiful. When you pluck, tap, or bang on your instrument, you are creating music. And to me, there aint nothing as good for the soul, as hearing your once empty fingers, playing to a warble, a jig, or a ditty that you've created. So I guess the message hidden beneath my words here, is that sound is beautiful, but music-making is even more so. Don't believe me? 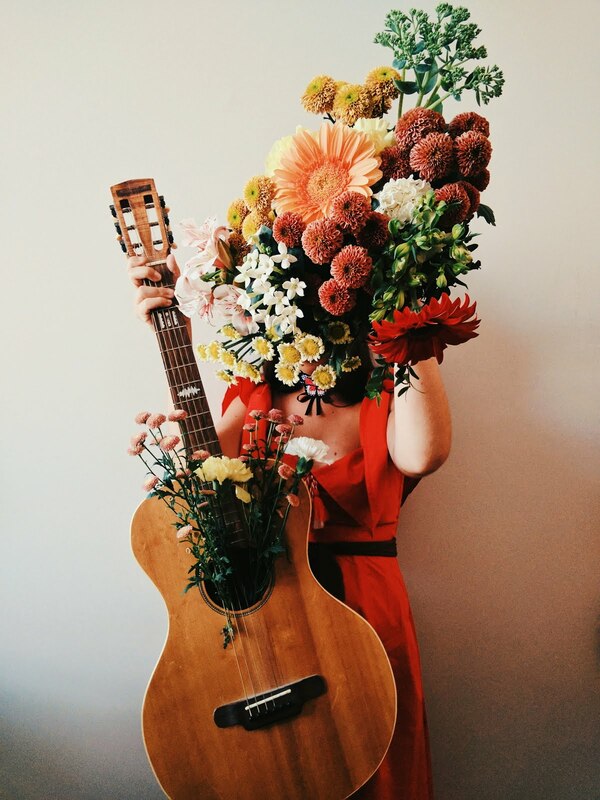 Pick up that dusty guitar, your silent piano, the rusty old harp, or the kitchen spoons. Let the birds listen to you. Gosh you pretty thing you! 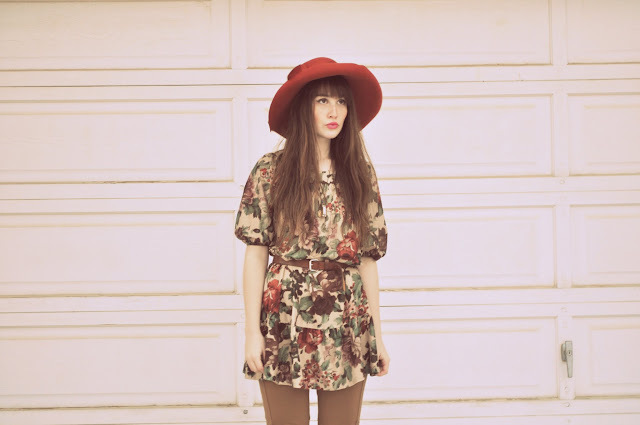 I love this top on you soo much, floral is my favorite thing ever :) You always take the most beautiful photos too! Wow. Such a poetic post. 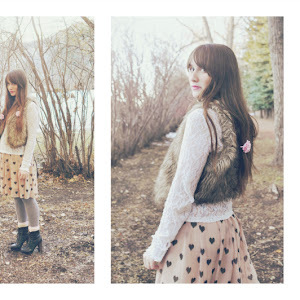 This outfit is just really cute. I think ill start playing my Piano again. Its been too long, you are right. Thank you for the inspiration. I may never be Mozart but that's not what matters. Amy, you are such an enlightening soul. This post really made me inspired. Nice outfit! !I totally agree with you with what you're saying about music-making!I love playing my guitar and writing lyrics-even though I'm not that good at it!The process of doing it and having a good time is more important than the outcome! you look so cute in these photos! the dress is just adorable! 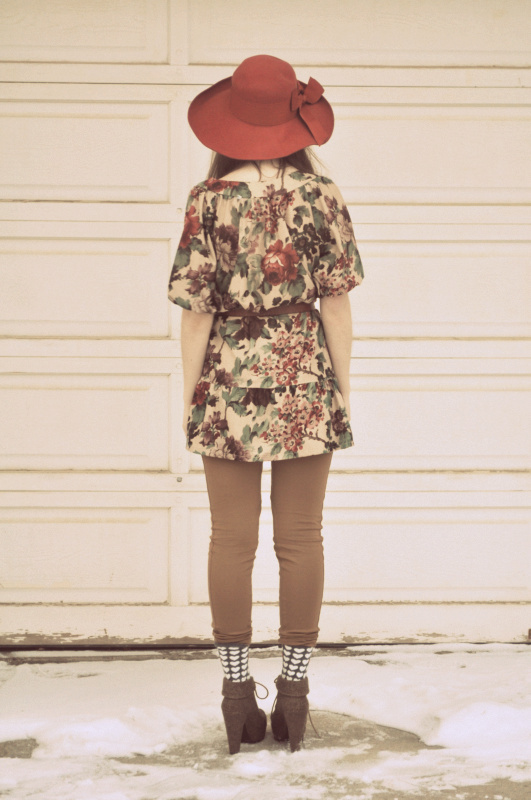 Oh really pretty look :> Nice hat & socks ^^ SO cute. I hope your examen went well.. I loooove :) those boots are pretty awesome too!!! I wish I could have hair like yours, it goes really well with the red hat and floral shirt. 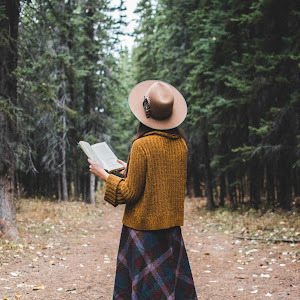 and i love the fact that you're not just a fashion blogger but you write too! i love your shirt and boots!!!! love love love! that top is gorgeous and you write so well! That's so cute, the title of your post... Very heartwarming talking about going home :p And I heart all those pieces you put together, the clashing patterns and warm palette. You look lovely! Oh gosh your so pretty and effortlessly stylish! How you create such magic from words, I will never know - magic that I can see flying through the room, magic that makes every second sparkle. Please never ever stop writing, I do not know how I would survive. So beautiful both your pictures and words. Ahh your socks are well cute!! I love the last photo as well how you put the hearts on it!! Very cute!!!! Love you blog sweetheart!! Love the outfit, you look fab as ever. Keep us inspiring. You look GORGEOUS! Love the colour scheme and how you've belted the top! 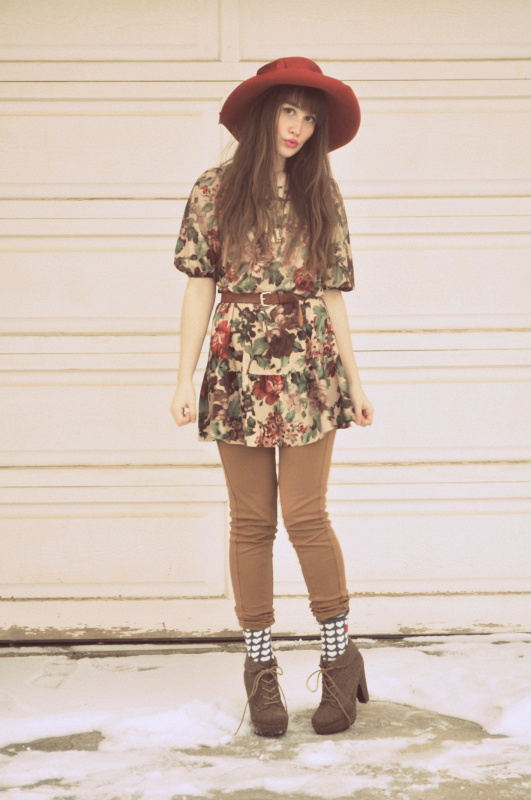 i really like the shoes and shirt/tunic! your blog is wonderful!!! love your style so girly, but most of all i love they way you write!!! continue like this girl! I love the way you write your posts. I wish I wrote in that manner on my fashion posts. It's inspiring and lyrical and beautiful. And as always, I love this outfit. So muted, so put together. The socks and heels take it to the next level of beauty. 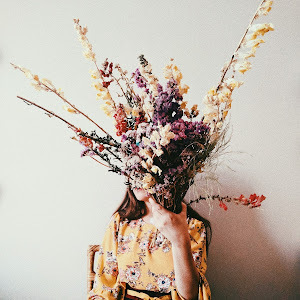 Your sense of whimsical beauty is so rare these days and it makes me smile! This outfit is AMAZING. 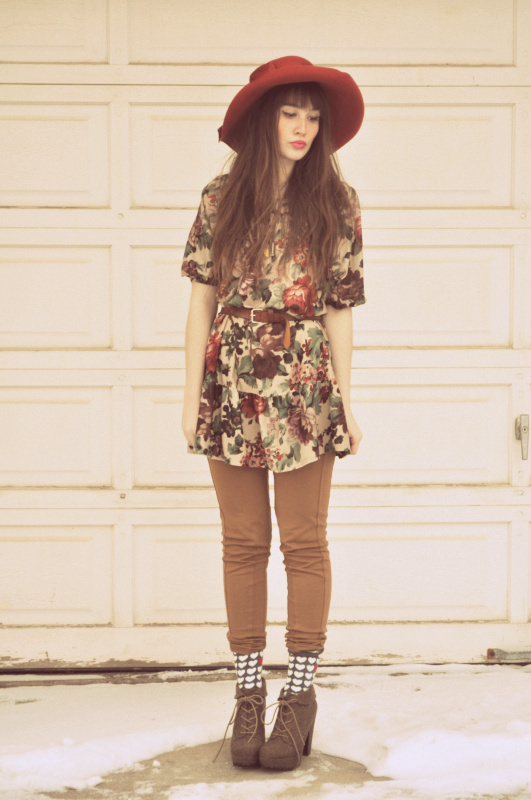 I love the hat and of course...the heart shaped socks! great outfit, i love the layers! 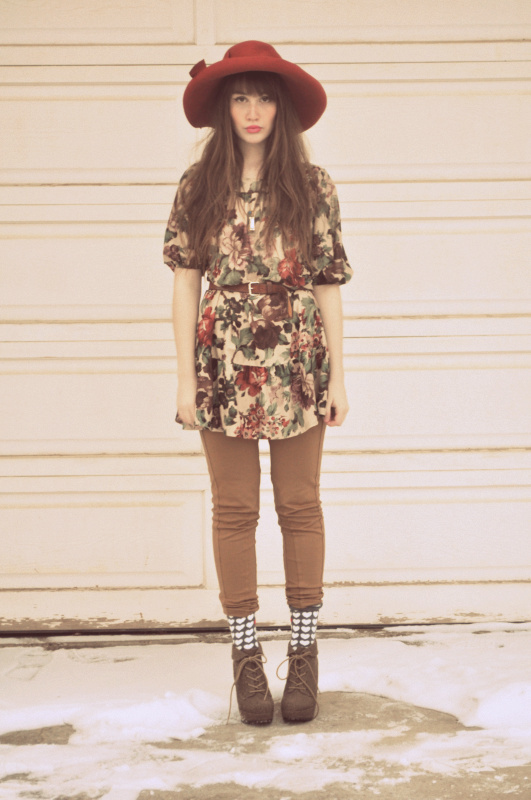 This outfit is amazing, you are so pretty! I know, time does go by way too quickly..
Ah I love it. 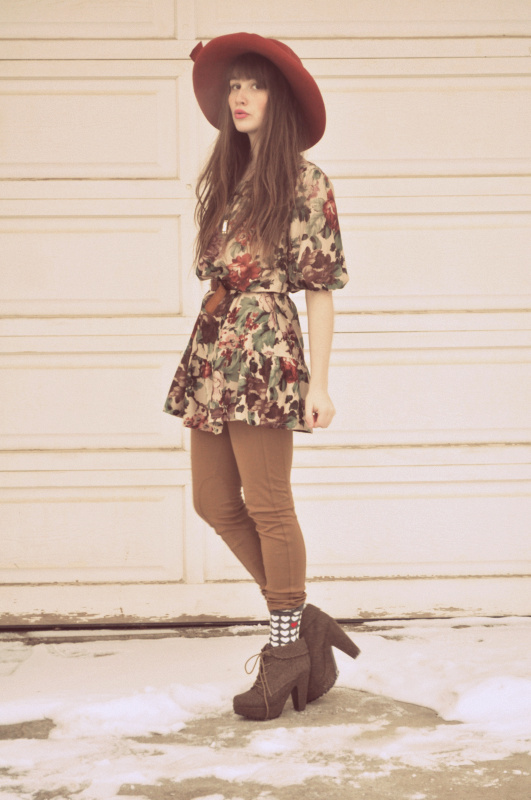 That hat and the heart socks and those cool boots. You look amazing as always. I really enjoyed your ode to music. I've played the trumpet for nearly 12 years. I don't compose my own songs, but there really is something special about just making music. I find it especially nice playing along with others. 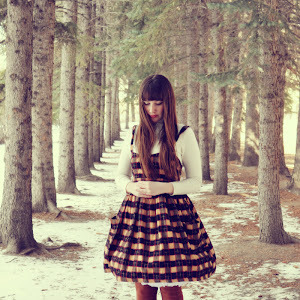 I love how original you dress, you take chances and it always comes out looking so lovely! 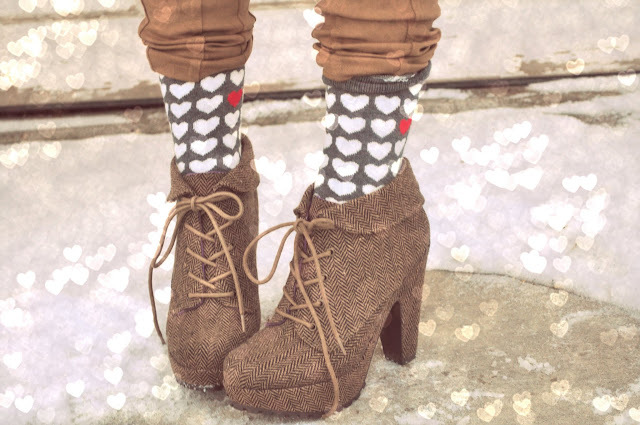 Especially love those heart socks, anything with hearts at the moment has me swooning! 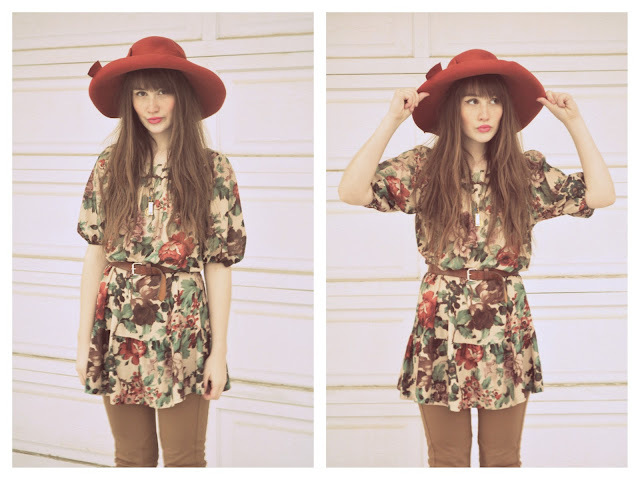 Beautiful blouse too, autumn florals are my favorite! I am a sucker for heart print anything. Now, my own kettle is calling. I love the dress! this outfit is pure perfection. great look, drooling over those shoes!!! 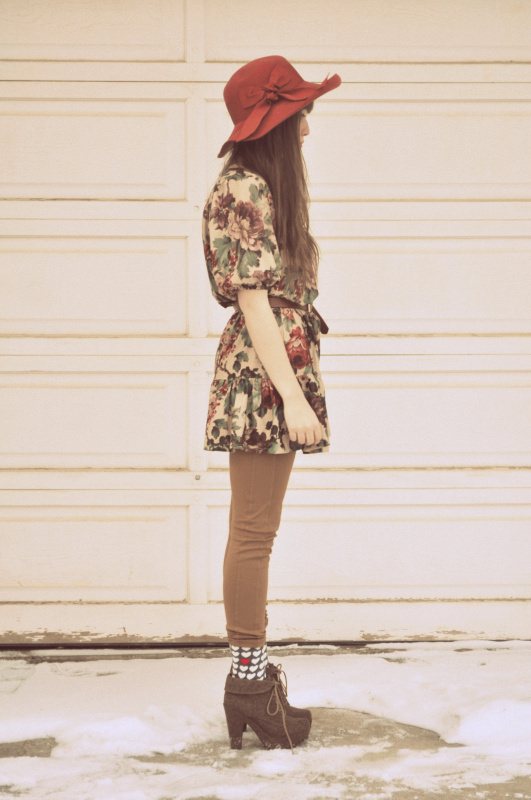 You look great :) I love your socks and shoes! superb love your chunky heels! aaaa your outfit fabulos too..
this outfit is love. and ur words are so beautiful.